Progress continues to be steady. Mike must be finding some trail to ride. 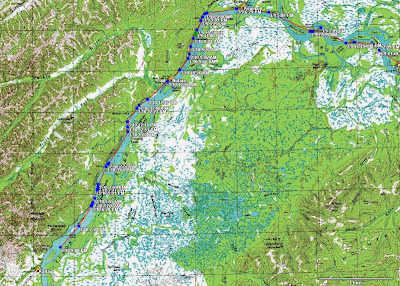 Pete and Carl are into Unalakleet and reported even better conditions from Kaltag. More good news. Kaltag is mile 710 for Mike, which means he's at the 2/3rds mark. With a little over 15 days on the clock, he is still on schedule to finish in 25 days or less. Of course these speeds are lower than actual speed, and the distance is short since the SPOT points are widely spaced. Mike is very near the edge of the SPOT coverage, but so far so good. No loss of points as of yet, but we will see how it goes as he nears the coast and proceeds further west towards Nome. Unalakleet will be the largest community that racers will pass through from Knik Lake to Nome and is their next destination some 82 miles from Kaltag. This section leaves the Yukon river and follows a route that has been used for thousands of years by native people in the area. The last 15 miles of the trail are infamous for sudden winds, snow and conditions that wipe out the trail in minutes. In past years the sled dog race directors have closed this section of trail or advised against traveling on it due to bad conditions. Pete does expect this portion of the trail to take a while and they will have two cabins on the route to use. About 35 miles from Unalakleet is Old Woman cabin where, as the legend goes, if you stay at the cabin you must leave some food for the old woman or she will chase you all the way to Nome with bad luck. One of the ways that people are advised of the conditions coming into Unalakleet is if they can see the airport beacon or it's reflection from about 16 miles out the weather should be good and if not use caution. Mike won't be staying at the cabin, so he won't need to leave any food. A final observation is that I've been getting several OK points. I am not sure how the SPOT works, but I think it gives some feedback as to whether or not the OK went through. It's likely that Mike is checking to see if the SPOT is still working as approaches the edge of the coverage area. Mike's progress in light of the scratches of more supported racers is nothing short of mind boggling. His experience is shining bright right now. I'm so glad he overcame those equipment difficulties and has been able to push on. Thanks for all the updates Scott. Looking good. I only wish Doogan could understand all this as I am sure he is missing Mike! You too Lenore? Glad that he is pushing the pedals instead of the bike now at least. And everyday the load is a bit lighter too which has to be a positive on the mental side of things. Mike is the man and proves it about every time he heads out the door.